Dr. S. Krishna kumar is a graduate in Mechanical Engineering. He holds a Post Graduate M.A. 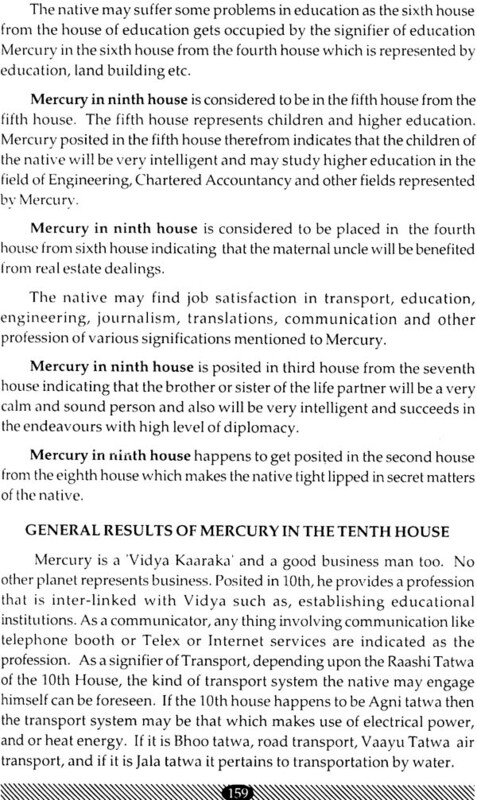 Degree in Astrology from Potti Sreeramulu University, Hyderabad, India. He has been conferred Ph.D. by the open International University for Complementary Medicines, Sri Lanka for his thesis on Medical Astrology. He is running an engineering industry in Peenya Industrial Estate as an ancillary unit to Karnataka State Road Transport Corporation. He is currently the national vice president of the Indian Council of Astrological Sciences, Chennai. He has served as Chairman, ICAS Bangalore Chapter-I for over a decade and is teaching Astrology to the students at Bharatiya Vidya bhavan at its branches in Bangalore and Mysore in India since many years with a team of lecturers to teach Astrology, Vasthu & Palmistry in English and Kannada mediums apart steering various Astrological activities like conducting seminars and conferences. He is an adjunct faculty member of the international Vedic Hindu University, Orlando, Florida for imparting distance education in Astrology. He has been conferred various titles such as Jothish Kovida, Jyothish Vachaspathi, Jyothish Bhooshana, Jyothish Bhaanu and Jyothish Bhriddacharya by the Indian Council of Astrological Science, Chennai, founded by late Dr.B.V.Raman, for his yeoman service in the field of Astrology. He is a recipient of the titles such as life time Achievement in Astrology, Jyothish Shastra Thaponidhi, Vasthu Vidyalankara, Vastu Vishwarkrma and hastha Samudrikalankara conferrd by many Astrological Associations in various seminars and conferences held in India. He has also been awarded titles such as Veda Dharmabhimani and Vedashree by many Vedic institutions. He has authored books on medical Astrology and Secrets of Bhavath Bhava which have been well received. 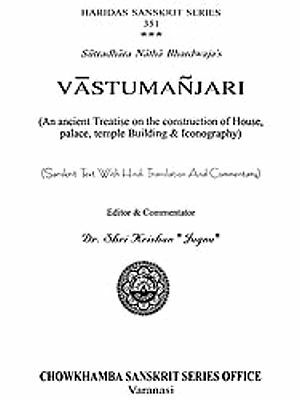 I am indeed very happy to write a few words of appreciation on the magnum opus of Dr.S.Krishna Kumar , Secrets of BHavath Bhava, Thought the concept of this book is clear and simple in our classical texts, Dr.S.Krishna Kumar opens the greater vistas of thinking and elaborating the subject with high intuitive skill and interpretive insight. Vedic Astrology has greater depth and dimensions and only a learned and highly evolved astrologer can see and understand the Vedic Wisdom, stellar and multi dimensional approach of the science. 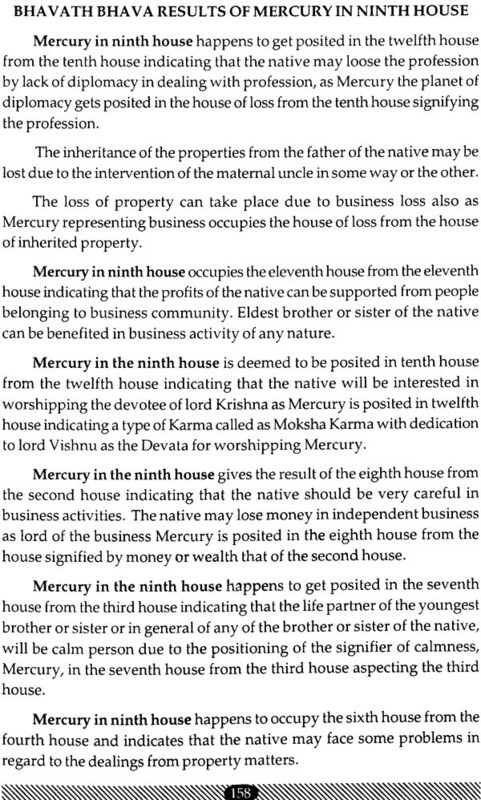 He has explained the crux of interconnectivity of planets and houses in analyzing a Bhava in the principle that a house which is bad for the native may be good for the kith and kin and surroundings of the native, in an exemplary manner substantiating the fact that no planet or house is good or bad. 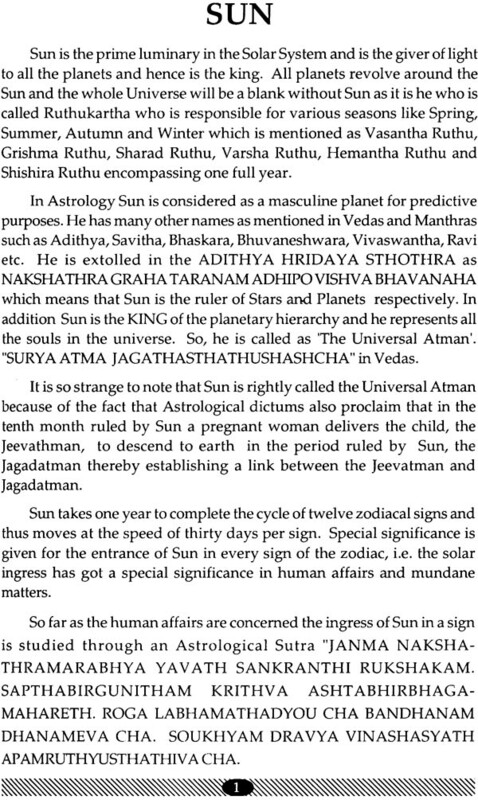 Dr.S.Krishna Kumar deserves high appreciation from all scholars and students of Astrology. His gift of interpretation makes a planet to speak from each angle, point and Bhava. I feel that he has done his best in bringing out this book to show this world that Astrology has never lost its track and prove beyond doubt that it is a beacon light for everyone to seek. Wishing him all success. Dr.S.Krishna Kumar is a versatile scholar and had given the script of this book several years back to me to go through and give my opinion. I found that he has dealt the subject of reading the Bhavath Bhava scrupulously by giving number of readings for a particular planet by interconnecting the Bhava. 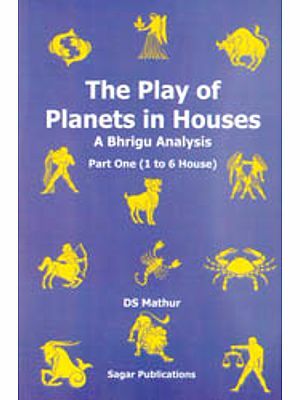 I have found this book useful to the general public, a practicing astrologer and also a student as he has given the results of the placement of a planet in a Bhava with reference to other Bhava which requires a very sharp skill to assess the bhava without any blemish. 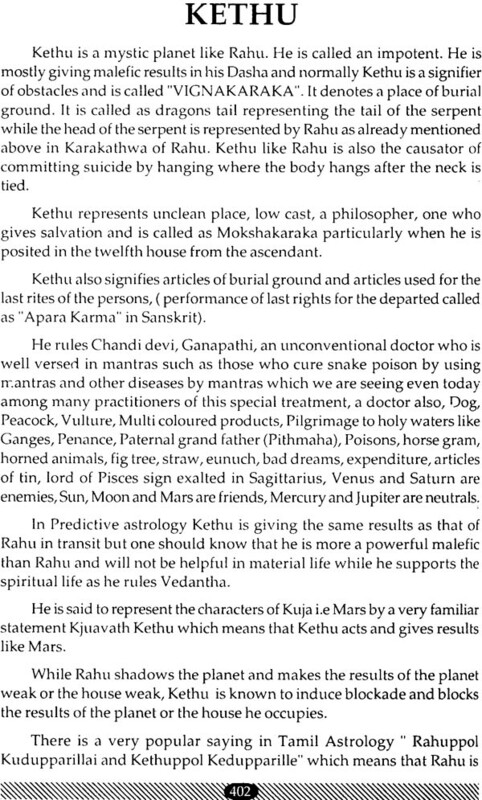 He has already authored book on Medical Astrology and Vedic Astrology which were well received. He is now coming out with another book on the secrets of Bhavath Bhava. 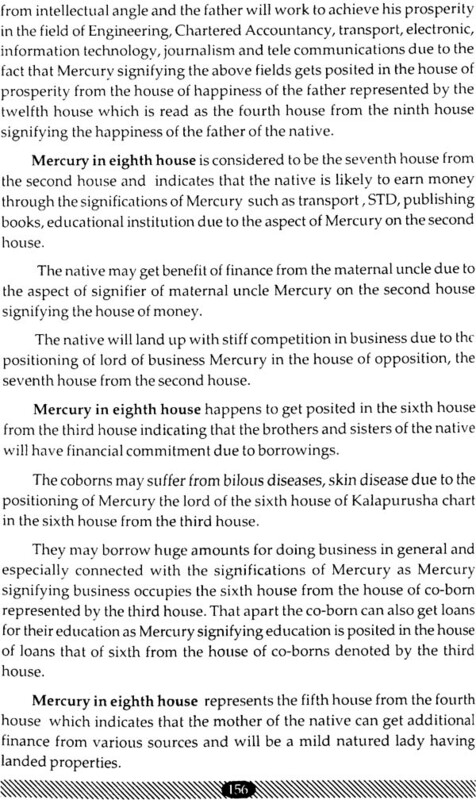 I feel that writing of a book of this type is possible only with a person of high dedication of the subject and wide knowledge and experience in predictions both of which I have found in Dr.S.Krishna Kumar. 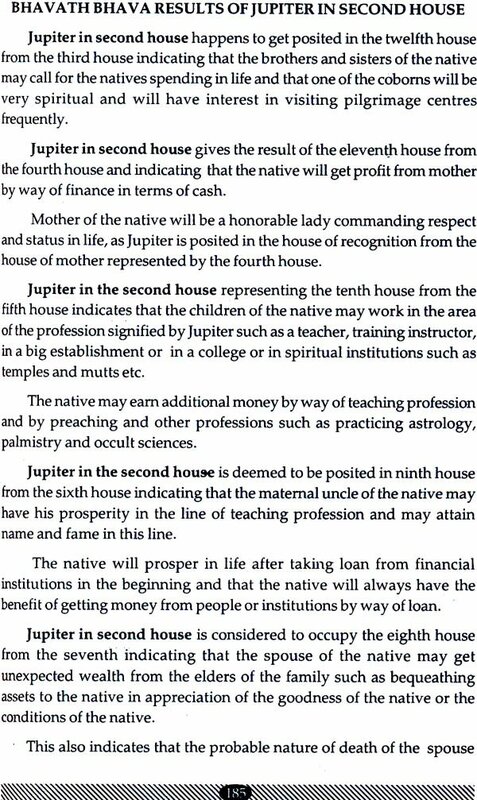 I fell that the Astrological fraternity is getting a book of immense value not only for the purpose of their studies but also for their research. I wish him all success and long life. 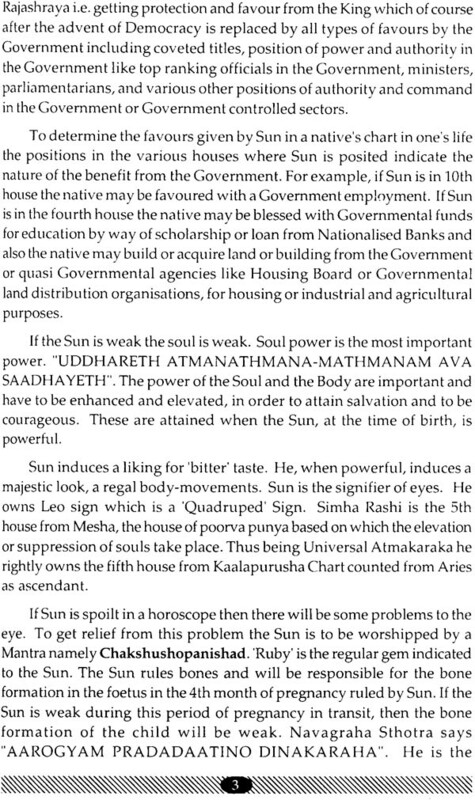 Dr.S.Krishna Kumar is a scholar in Astrology and Vedas. He has authored a book on Medical Astrology which was published by Bhartiya Prachya Evam Santan Vigyan Sansthan which has entered the second edition in a short span. 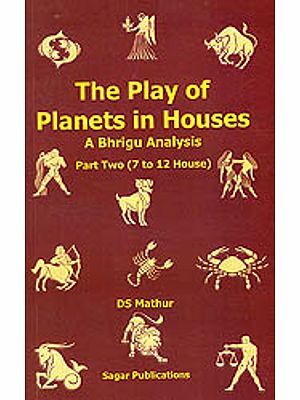 He has been contributing very useful books of quality in the field of Astrology and now he has come out with this book on Secrets of Bhavath Bhava revealing various results for a planet posited in a Bhava from other Bhavas. I appreciate him for his patience in giving such a large number of results leading to a book of mega predictions. The effort of Dr.S.Krishna Kumar is highly appreciable as writing such a book requires a high level of knowledge, clarity and skill of interpretation. 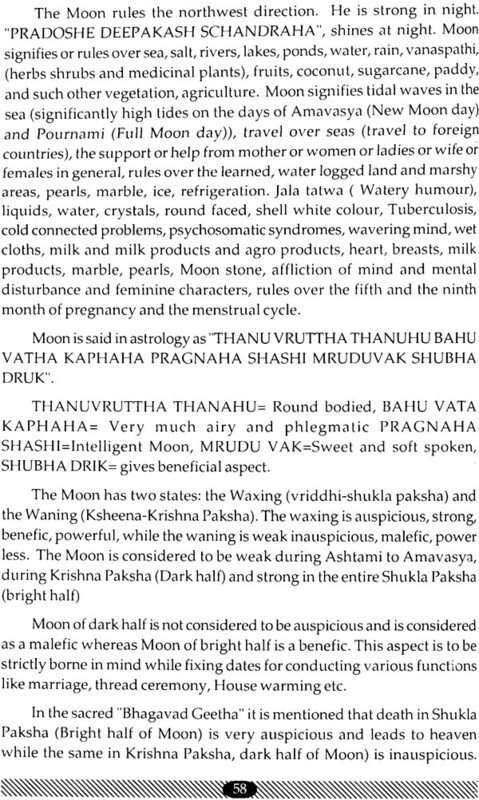 I hope this book coming out of his long experience in teaching, preaching and practice will kindle the intellect of many Astrological students and savants aspiring to give exhaustive and accurate predictions. 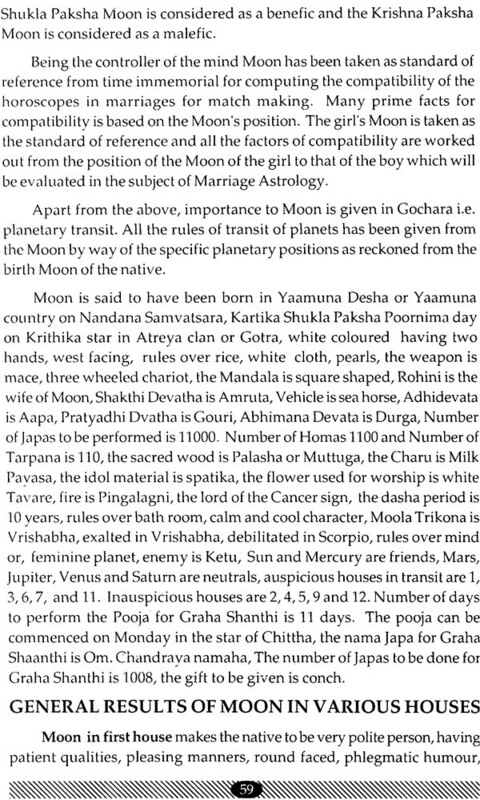 By bringing out this book I feel that he has done a yeoman service to the cause of Astrology and I am confident that this book will be received well by the students, Amateurs and Scholars of Astrology. 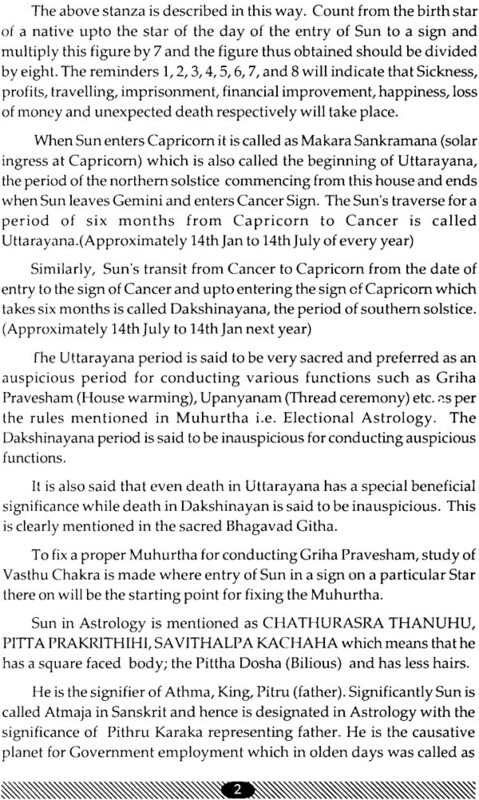 I pray God bless him with long life and contribute many more practical books of similar nature in the near future for the benefit of the Astrological fraternity. 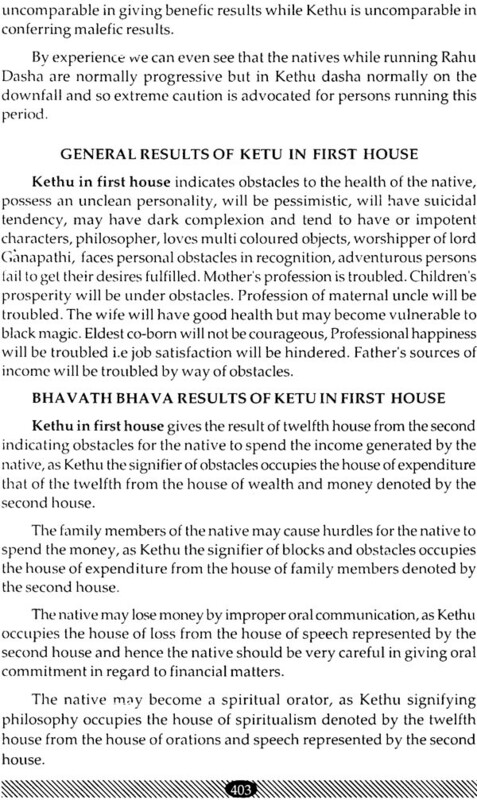 The book makes the departure from the ordinary to the unusual in its exhaustive treatment of the principles of “Bhavath Bhava “ not only in its application to houses but also the planets in their role of Karakas. 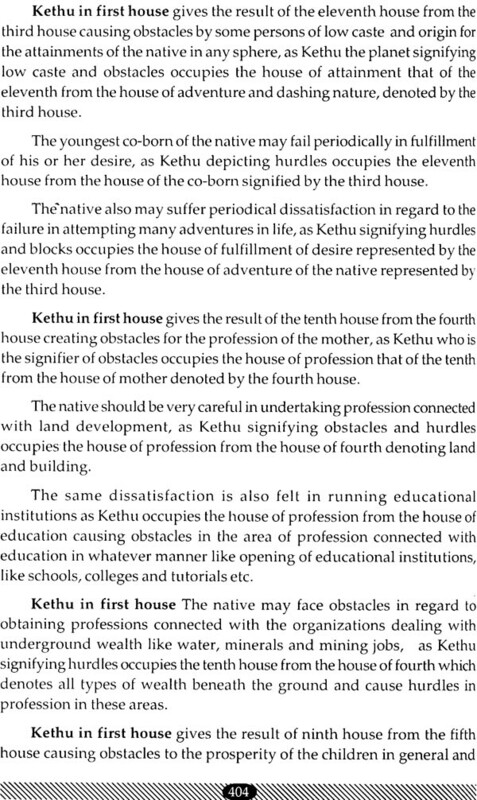 Dr.S.Krishn Kumar explores more than four thousand permutations and combinations in the application of this principle and in the process opens up a new vista of chart interpretation. 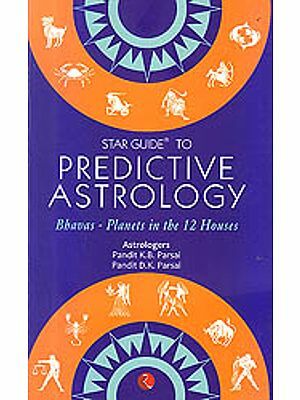 The book is bound to be a valuable guide to both the beginner and the advanced student of Astrology. 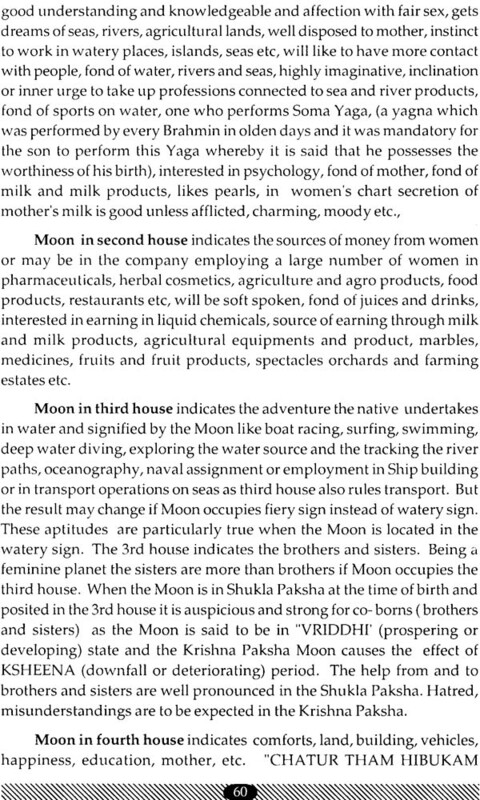 I sure the book will be a great hit with all Astrology enthusiasts. 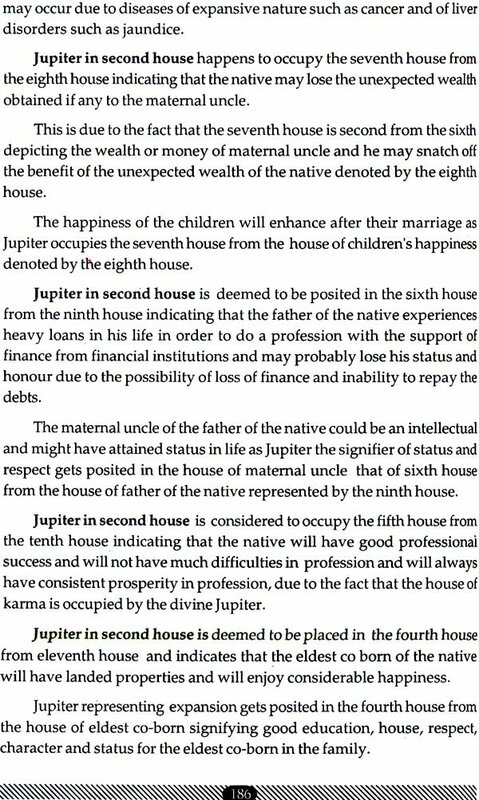 In this book the influences of planets in a house through interconnectivity of the houses is worked out and while doing so the fundamental significations of the planets are given in detail. 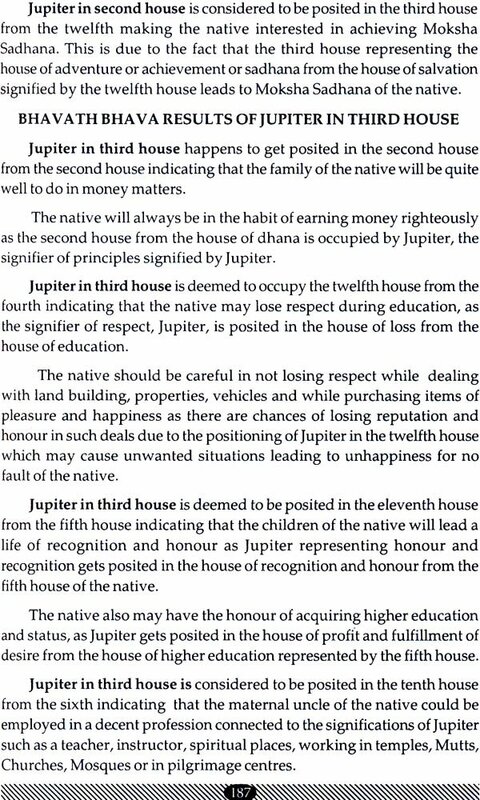 I have also tried to give the results of Bhavath Bhava for many activites of life of the native and the influences the planets have on the nearest relatives and their relation to the native in terms of loss and gain from them are enunciated. 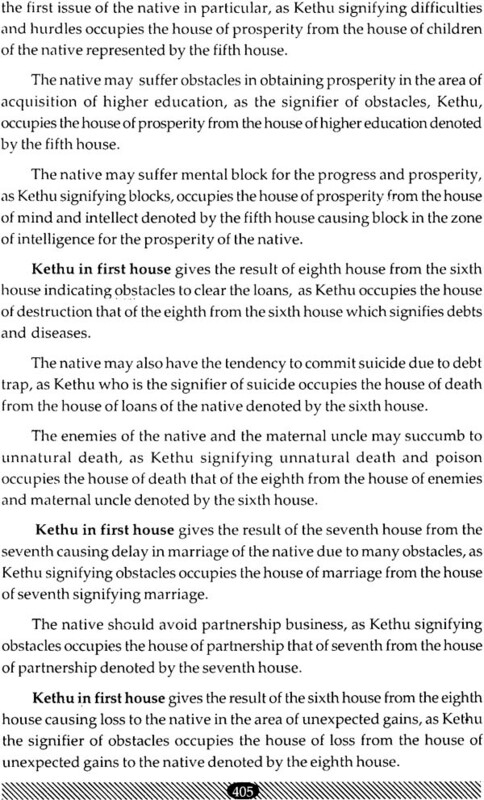 Only a few examples for each house have been given for the fear of the book becoming voluminous if all the significations are worked out for the prediction. 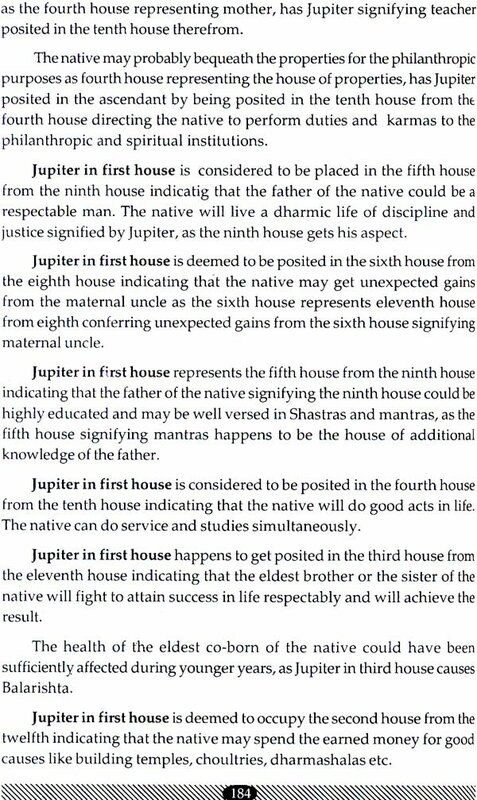 The results of the Bhavath Bhava have been worked out for a single planet posited in a particular house which can also be worked out in the similar manner for conjunct planets, a few of which have been dealt with for a some planets. 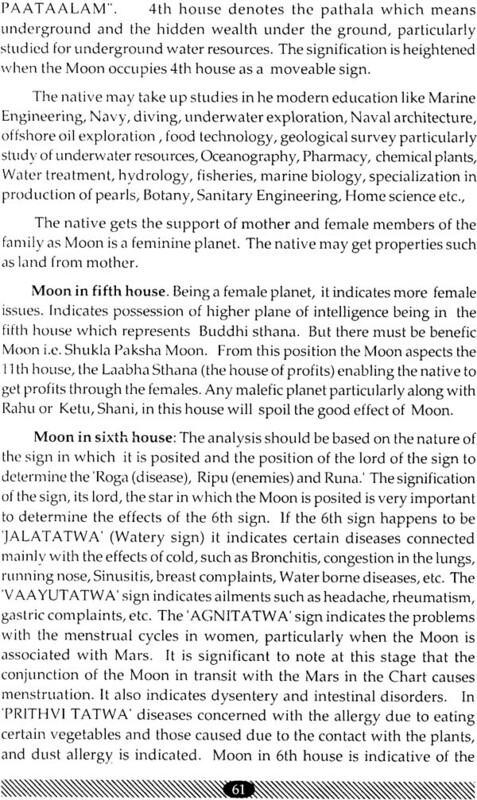 The results are worked out on the basis of the positioning of the planet in Rishi chart without considering the aspects as the basic result will always be felt though there is an aspect which can modify the result without disqualifying the right of occupancy of the planet. 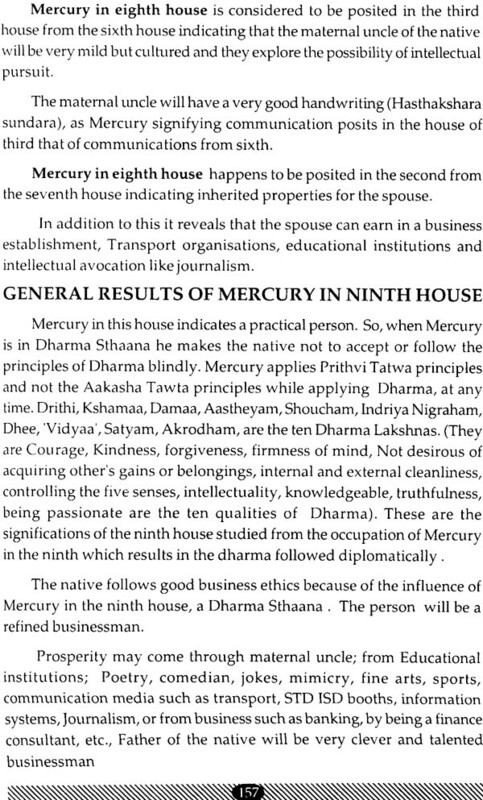 A deep analysis of the result of the planets mentioned through bhavath Bhava principle will reveal how a human being enjoys and suffers in life from the kith and kin and surroundings whether one wishes or not substantiating the law of Karma that one has to reap the fruits of one’s own Karma. I thank Dr.T.S.Vasan , Sri .M.N.Kedar. Sri. 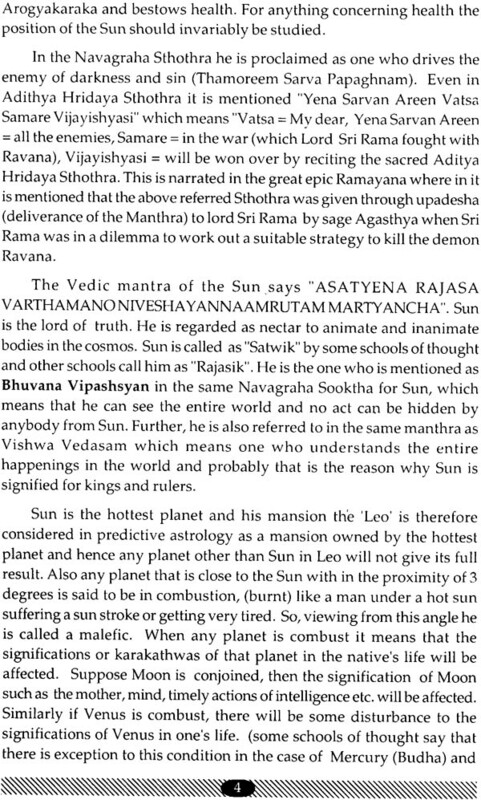 Bolanath Shukla and Smt.Gayathri Devi VAsudev who are the National Vice President of the Indian Council of Astrological Sciences and S.Ramu for giving their views of the book. I am highly thankful to my students Mohan Meharwani, Dr.Rao, sumathi, Kameshwara Sharma and Shivananda who have spent their valuable time for assisting me in bringing out this book successfully. I also thank my student Mr.A.Srinivas who has worked very hard by going through the text of this book and getting the book printed in a neatly in the midst of many of his activities. I cherish the support of my wife K.P.Kshama Devi and my children, K.Chetana, K.Nandana and K.Sughosh kumar who co-operated with me in many ways to bring out this book successfully.